I can't believe how fast kids are growing up these days. A year ago, my nephew requested a Spongebob Square Pants cake for 9th birthday. 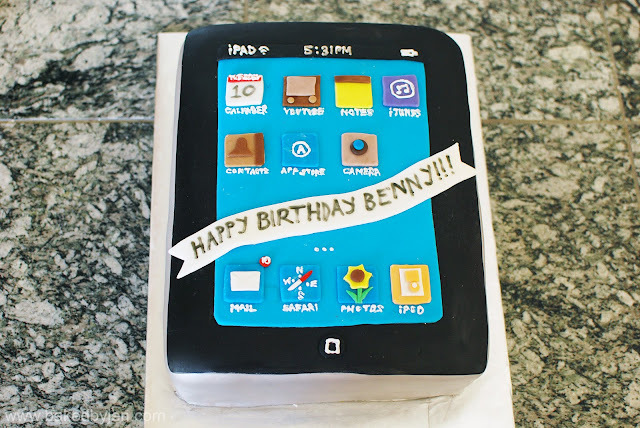 When I asked him what he wanted me to make for him this year, he replied with an iPad cake and all the apps! This cake was a white almond sour cream cake (adapted from Cake Central) with strawberry swiss meringue buttercream (adapted from Martha Stewart's Cupcakes). The frosting didn't hold up well with all of the fondant laying on top. I noticed a lot of bulging and air pockets later on. 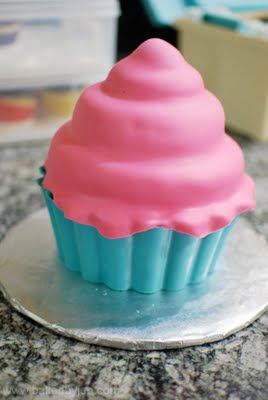 Next time, I would treat it as a filling and use a sturdier frosting as a dam. 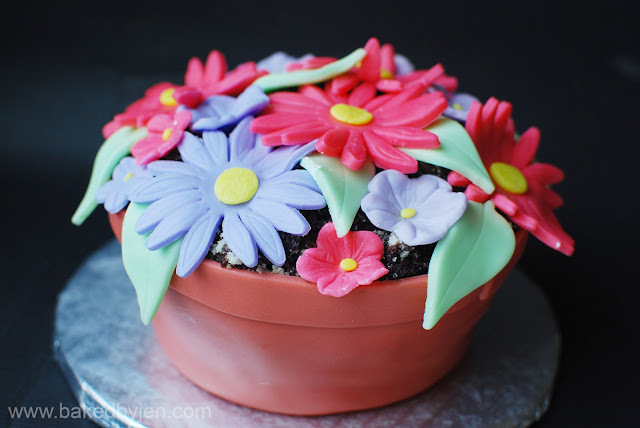 The details were made with a mix of store bought and home made fondant. I used royal icing on the cake and an edible food marker on the banner for the lettering. The bottom was heavily coated with silver luster dust. I say heavily because I realized too late that I didn't have enough white fondant. So, I ended up mixing together all my available fondant and I happened to have a lot of pink fondant. Just like last year, he wasn't shy about pointing out my mistake. I forgot the camera lens. But we fixed that by sticking the candle there. Overall, he was very happy with his cake as I was to make it for him. I'm not really sure where this Killer Cupcake is from but it was on my brother's girlfriend's Evite for her birthday party this past weekend. Last year, I made her the R2D2 cake and Star Wars sugar cookies; and it was my sister's great idea to make the Killer Cupcake on the Evite into a cake for her this year. 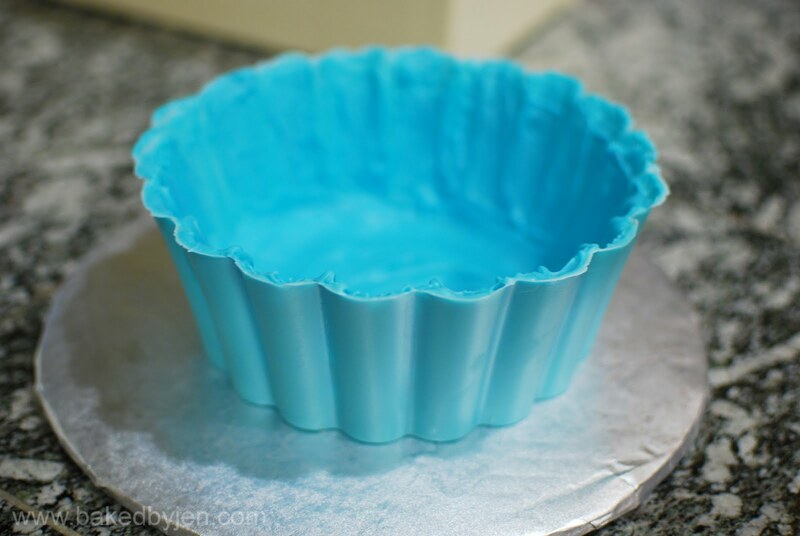 I have been waiting for an excuse to make a giant cupcake cake with a candy liner since I've seen it done around the blogosphere. I've used a mix of blue candy melts and white chocolate bark to make the cupcake liner. After two coats and 30 minutes total in the fridge, it popped right out of the pan. Reminded me of the time I made the cupcake bites (cake truffles). The cake didn't fit perfectly into the candy liner so I did trim the edges a bit. Because of the lack of frosting covering the bottom layer, I did torte it 2 times and piled the frosting on. 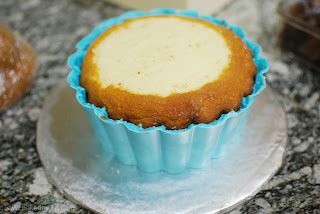 I also torted the top half of the cake, filled, and crumb coated it with frosting before covering it with fondant. Because the top layer ended up narrower than the bottom with the candy liner, I trimmed the fondant a bit wider to make it appear like the "frosting" is spilling over. With the leftover batter and frosting, I made some cupcakes as well. 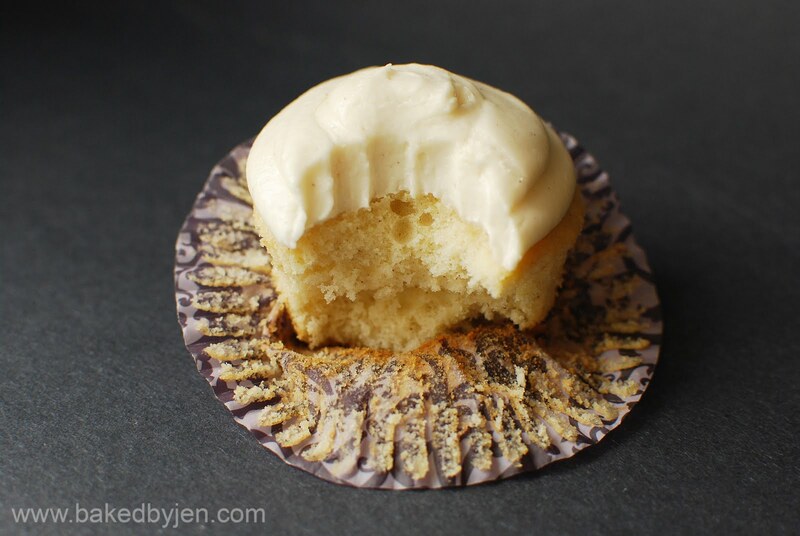 The yellow cake is one of my go to recipes while the chocolate frosting was a new one from Hershey's. I do not know why it took me this long to discover this frosting. 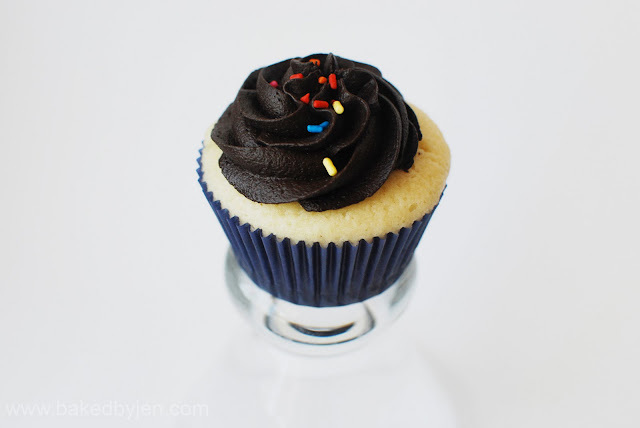 It is one of the simplest frostings I've come across while tasting so rich and full of chocolate flavor. Definitely, adding this to my go to list. 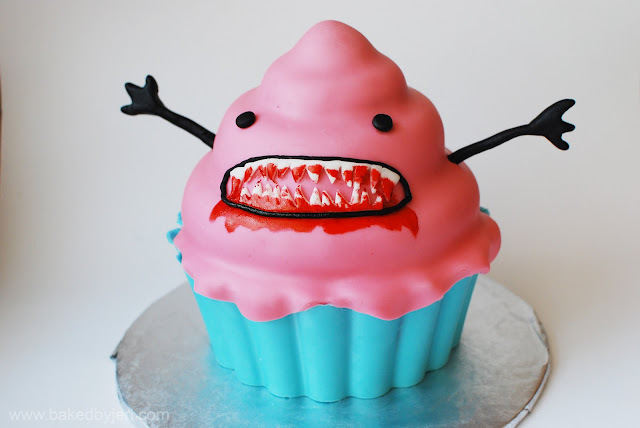 UPDATE: The cupcake image which was on the Evite that I was inspired by is by Natalie Dee. I, along with the other bridesmaids, hosted a bridal shower for my friend this past weekend. If you recall, I made chocolate chip cupcakes for this same friend's purple themed bachlorette party earlier this year. Because I had full range on what cupcakes to make for the shower, I went with one off my ever growing to bake list. 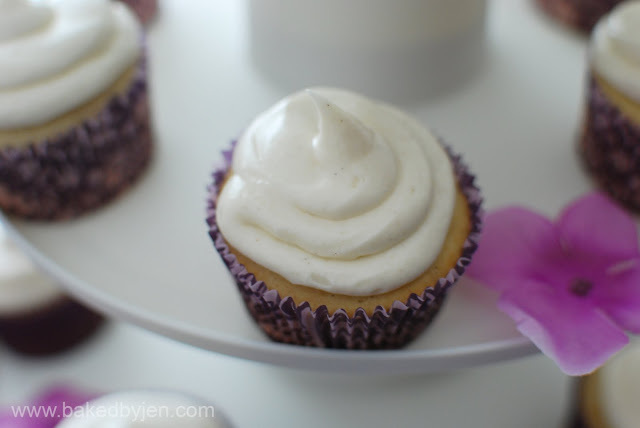 These cupcakes were banana cupcakes (adapted from Cake Central) frosted with my go to cream cheese frosting which I adapted by adding a 1/2 a teaspoon of cinnamon. I should've stuck to using the shortening as it was too dense as a cupcake. I can see it doing wonders for a stacked/carved cake though. I worked on two cakes this week, one for my Mom and one for my boyfriend's Mom for Mother's day. Both cakes are chocolate cakes with chocolate buttercream frosting covered and decorated with marshmallow fondant. The "soil" on the cakes is a mix of crumbled chocolate cake and vanilla cake which my boyfriend suggested; how ingenious! 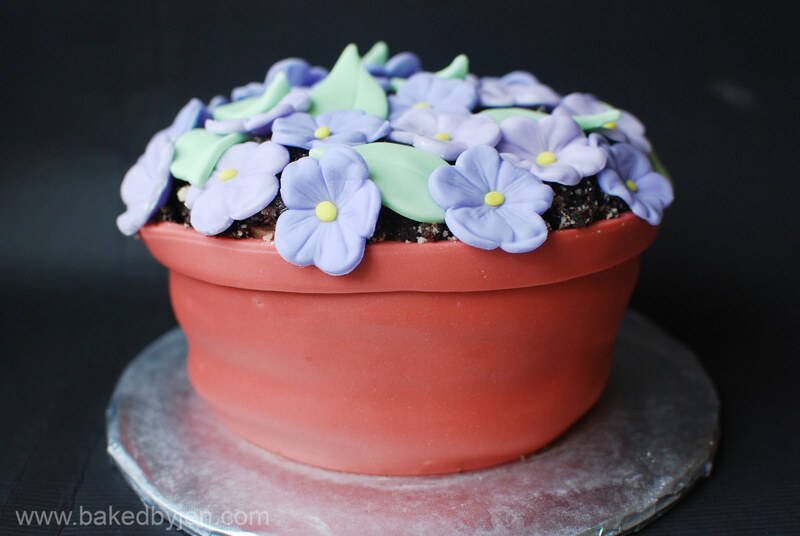 I only let the fondant flowers dry out for a few hours but I suggest allowing them to dry over night in flower formers or egg cartons to avoid looking so flat. Also, I wrapped the cake vertically in fondant which I noticed later caused a lot of sagging. 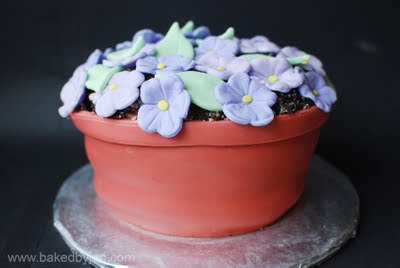 Next time, I would cover the cake upside down in fondant then flip it right side up. My brother happened to be attending a birthday party the same day I was doing a demo on how to cover a cake with fondant for the Cake4Kids' volunteers; so, I offered to decorate the cake for him to take with him. 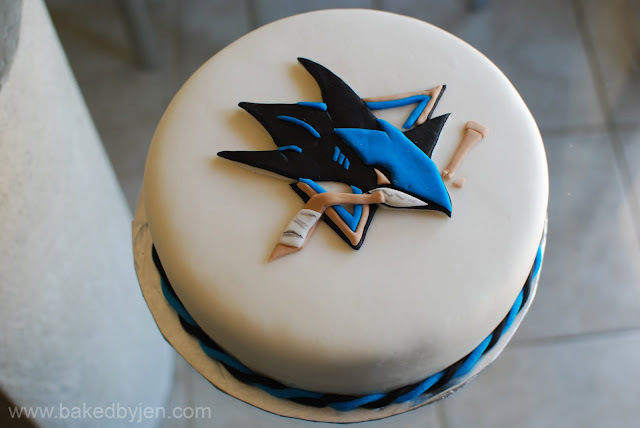 The birthday girl is a huge SJ Sharks fan, so I went with a simple and clean design focusing on the logo. The funfetti cake (doctored cake mix) with vanilla buttercream frosting was covered with marshmallow fondant and a braid border was added. The braid was made by twisting two ropes, made with the clay tool, together. It took me quite awhile to figure out how I would cut and layer the fondant pieces to actually get the SJ Sharks logo to pop. I'm glad I eventually figured it out.